(12:16:55 AM) nwsbot: Local Storm Report by NWS LOT: Rockford Airport [Winnebago Co, IL] official nws obs reports SNOW of M1.6 INCH at 11:54 PM CST -- storm total thus far, with 0.19 ice accum. (12:12:53 AM) nwsbot: Local Storm Report by NWS LOT: Rockford Airport [Winnebago Co, IL] asos reports FREEZING RAIN of M0.19 INCH at 11:54 PM CST -- storm total ice as measured by the rfd asos thus far. 10:30pm Update: Current road conditions across northern Illinois - many roads reported all snow/ice covered. Travel is not advised tonight! (9:53:21 PM) nwsbot: Local Storm Report by NWS DVN: 3 N Stockton [Jo Daviess Co, IL] co-op observer reports SNOW of M2.5 INCH at 09:52 PM CST -- melted 0.15 inches. (9:46:32 PM) nwsbot: Local Storm Report by NWS DVN: Milledgeville [Carroll Co, IL] trained spotter reports SNOW of M1.6 INCH at 09:44 PM CST -- light glaze of ice also reported. (8:52:45 PM) nwsbot: Local Storm Report by NWS DVN: 1 N Sterling [Whiteside Co, IL] broadcast media reports SNOW of M1.0 INCH at 08:51 PM CST -- freezing rain occurring currently, light glaze on all surfaces. 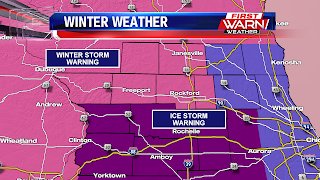 10:00pm Update: Carroll, Whiteside, Ogle, Lee and DeKalb have been upgraded to an Ice Storm Warning and Winnebago and Boone counties have been upgraded to a Winter Storm Warning. 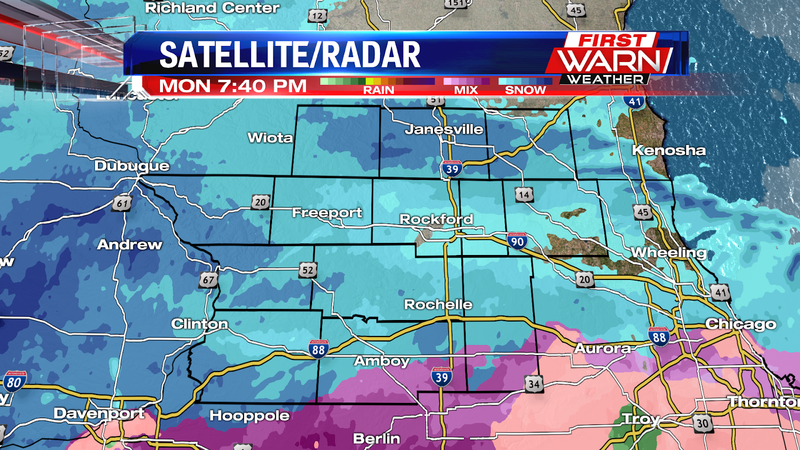 Freezing rain has been falling mostly along I-88 this evening, with already a glaze of ice reported in Whiteside County. 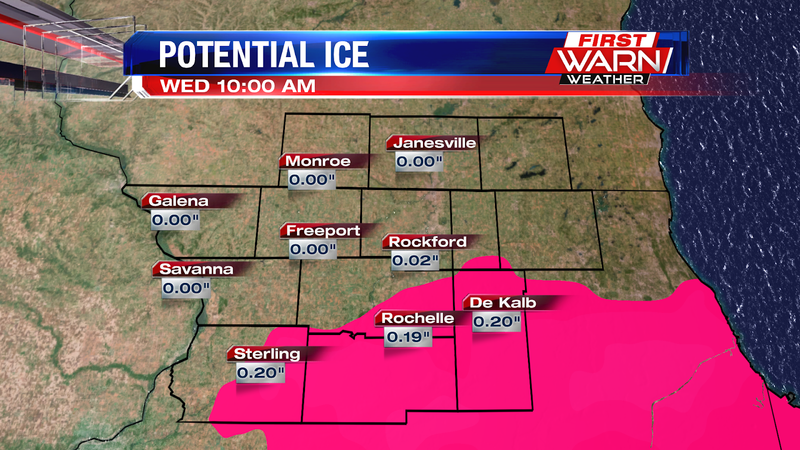 Ice accumulations of up to a quarter of an inch, if not more, can be expected in those counties by Tuesday morning. 9:00pm Update: Beginning to see more freezing rain mix in with the snow across Whiteside, Lee, Ogle and DeKalb counties this evening. 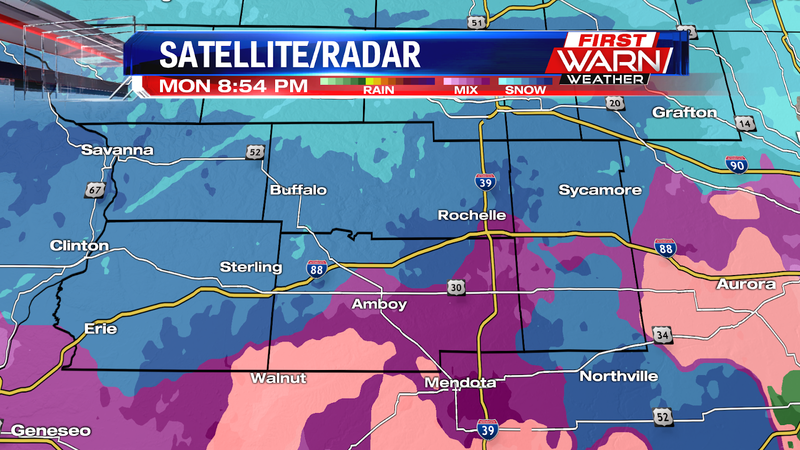 Our weather watcher in Esmond (DeKalb County) has reported mostly freezing rain for over an hour. 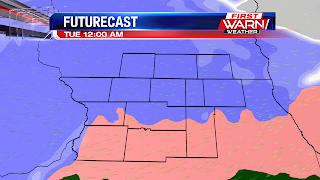 Road conditions will continue to deteriorate through the overnight and early Tuesday. Winter Storm Warnings and Winter Weather Advisories continue for northern Illinois and southern Wisconsin, lasting through Midnight Wednesday. 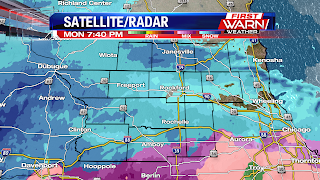 The snow was quick to move in Monday evening and has been quick to accumulate across northern Illinois, with already a couple inches of snow measured in Stockton (Jo Daviess County). 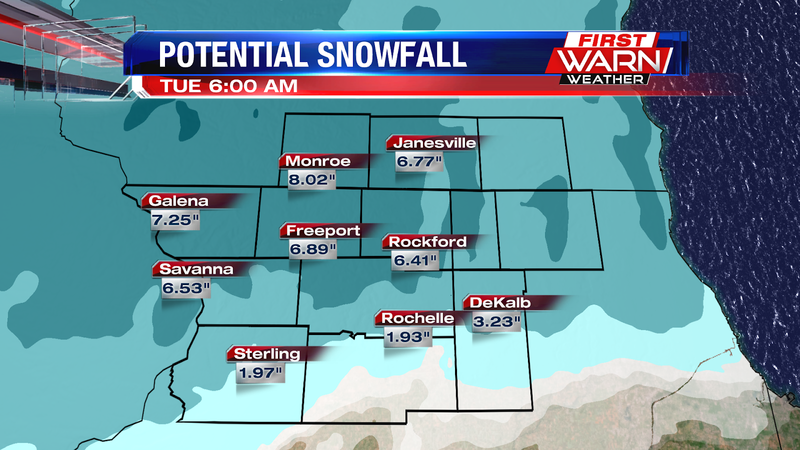 Ogle, Lee and DeKalb counties and will be most likely through early Tuesday morning. 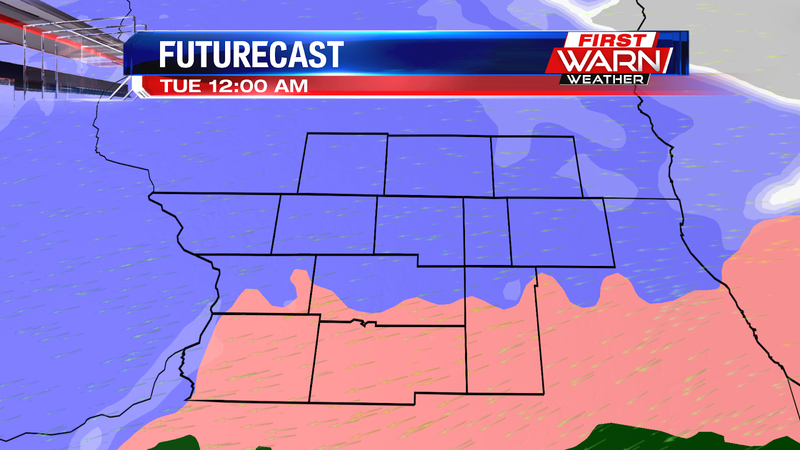 The heaviest sleet/freezing rain rates may occur after Midnight. 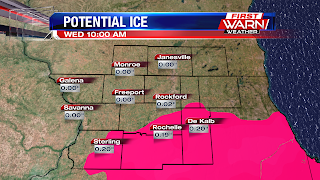 There, snow totals will be reduced but ice accumulations will be higher and could add up close to a couple tenths of an inch. 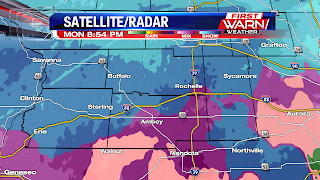 Roads were quick to become snow covered Monday evening, despite temperatures in the upper 20s and low 30s. Roads are slick and will remain slick during Tuesday morning's commute, even though the snowfall will remain a little more scattered. 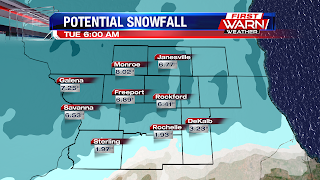 Area wide snow totals will range between three to six inches, with locations northwest of Rockford receiving totals on the higher end due to a longer period in snow. As the low pressure system passes to the east Tuesday winds will shift around to the northwest during the morning and afternoon, gusting close to 40 mph by late afternoon. Additional snow showers will occur on the backside of the low which when combined with the wind, will likely drop visibility and cause some problems for the evening commute.